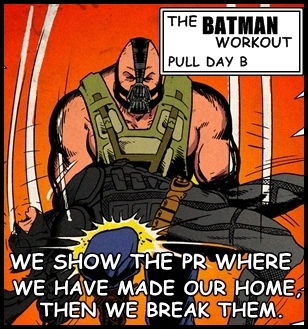 Another aspect of becoming The Bat is cardio conditioning. You’re gonna be in quite a few fights, doing a lot of running, and jumping about. Again, another reason why he’d be on steroids is because he’d have to do a lot of cardio, but still need to maintain his size & strength. I’ve been doing a grab bag of cardio. Incline walking on the treadmill, standard walks that go about an hour, sprinting, jump-rope, and HIIT on the eliptical. Each has their merit. Incline cardio is great for burning fat, and helps to build up muscle & strength in the legs. Standard walking, for long distances, just builds up your endurance. Sprinting is obvious. It really works the cardiovascular system, and builds up your entire lower body. Do about 6 or 7 40 yard sprints, and really try to stop yourself quickly, like you’re about to hit a wall. I did that last week, and my legs and abductors were pretty sore. Doing HIIT on the eliptical is nice because you can go balls out, and it saves your body a lot of wear and tear.